Odoo gives you the possibility to change the default packaging type and adapt the packaging the way you want it, depending on the weight of the order. In the Inventory module, Go to Configuration and then click on Settings. In the Sales module, go to Sales and click on Sale Order. Create your new Sale Order, and Confirm the Sale. Once you've confirmed the Sale, you need to click on Delivery, to be redirected to the Delivery order. Click on Edit, and you can now change the packaging. 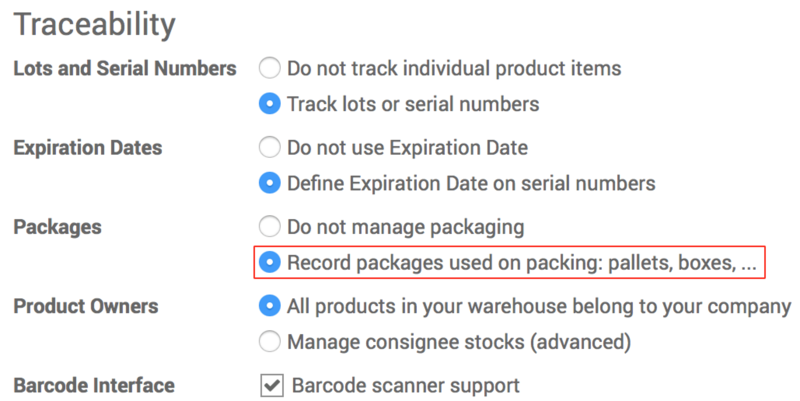 In the Operations tab, in the last column, change the 0 and put the number of products that you want to pack together. Then click on Put in Pack. Choose the type of packaging that you want. You can also see that the weight has been adapted to your package, and you can change it manually if you want it to be more precise. Then click on Save. Repeat the operation until all the products are put in pack. Finally, click on Validate to confirm the delivery.